Posted on Sat, Mar 3, 2012 : 5 a.m.
Susanne Langer, who was a professor of philosophy at Connecticut College from 1952 to 1962, said, "A signal is comprehended if it serves to make us notice the object or situation it bespeaks." 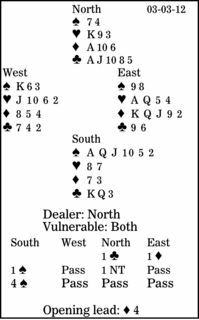 For bridge defenders, a signal is comprehended if partner decodes the message it bespeaks. How should East signal at trick one in today's deal? South is in four spades. West leads the diamond four, and declarer takes the trick with dummy's ace. Often it would be right for East to signal with the king under dummy's ace to show his touching honors. First, though, East should ask himself where his side will find four winners. When West gets in with his spade king, a heart lead should stand out like a tuxedo in a tiki bar.